The secret to planning a deeply personal and meaningful wedding has nothing to do with budget. It’s about creating a celebration that reflects a couple’s core values. Translating those values is the work of Modern Wedding, an information-filled guide with hundreds of creative ideas and beautiful, inspiring photographs for readers to look at and say, “This feels like us.” The book unpacks every element of a wedding - stationery, attire, seating plans, flowers and tablescapes, food and drink, gifts - with examples that will appeal to couples who care about how things are made but are not overly influenced by trends. The emphasis is on natural surroundings, seasonal flowers and food, modern dresses, minimalist ceremony structures, and naked cakes. Photographs of real weddings - “case studies” like a destination fete in Tuscany, a house party in Brooklyn, and a New Agey revel in Kauai - show how all the pieces can come together into a unique and expressive whole. Extensive practical information and resources give readers access to all the help they need for their own unique celebration. 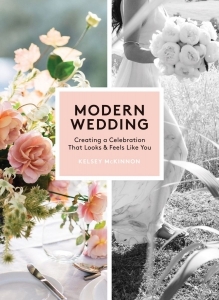 At last, a guide to planning a wedding that reflects how we live and entertain today.